So… did you test with National Geographic’s Geno 2.0 project? Turns out that within the past few days, the Genographic Project has started reporting the percentage of participants within the Geno 2.0 project database with particular paternal and maternal haplogroups. And any man who’s tested will also have a YDNA haplogroup reported — and as more and more of the Y chromosome is mapped and differences detected, we can hope for a deeper understanding of the male inheritance of modern humans as well. And that’s part of where this number bit comes in. Knowing the frequency with which certain haplogroups appear, and where they appear, can help population geneticists develop and test theories about human migration over time. This is one of a series of efforts made be genetic genealogists to gather information about how common haplogroups are and how they’re distributed worldwide. Some nine years ago, for example, Dr. J. Douglas McDonald, a professor of Chemistry at the University of Illinois at Urbana-Champaign produced maps of the distributions of YDNA and mtDNA haplogroups around the world. The copyrighted maps can be found online here. And as genealogists, we’d like to know more about how frequently a particular haplogroup appears, to help us understand the significance of a match or a mismatch within, say, the H3 mtDNA haplogroup (1.6%) or the R-L21 YDNA haplogroup (4.8%) as compared to one in, say, the V3b mtDNA haplogroup (less than 0.1%) or the R-V88 YDNA haplogroup (0.1%). Right now, the percentages are being reported individually, on the dashboard for the results of each person who has tested. And as genetic genealogists, we’d like to know the big picture: what are the percentages for all the haplogroups? So ISOGG under an initiative by Dr. Tim Janzen is in the process of collecting the individual information about each reported haplogroup, and collecting it in Excel spreadsheet form for everyone’s use. The links to the spreadsheets are on the ISOGG Haplogroup wiki page under the link titles Geno 2.0 Y haplogroup percentages from the Genographic Project and Geno 2.0 mtDNA haplogroup percentages from the Genographic Project. 1. Log in to your Genographic 2.0 results. 2. Click on the link at the top for Dashboard. 3. Scroll down to your Deep Ancestry results. Record your haplogroup name and the percentage. 4. Take a look at the ISOGG spreadsheet(s). Is your haplogroup reported? a. If so, terrific! You’re done. b. If not, report it! Let ISOGG know. You can post your number on the ISOGG Yahoo group list in the thread started by Tim Janzen if you’re an ISOGG member. If you’re not an ISOGG member, feel free to post your results in the comments to this blog post or, for email subscribers, just hit reply and email them. I’ll collect them and send them along. You’ll be helping us all know more. And besides, “Hi, I’m H3 1.6%, what’s your number?” beats the heck out of “Hi, I’m Pisces, what’s your sign?”, doesn’t it? It may sound a stupid question, but won’t the Genographic Project just give the full list ? Not a stupid question and the only possible answer is: not yet, if at all! Is this really ethical? Dr. Wells is running a science project whose funding is dependent on publishing in top-tier journals. His team have expended an enormous effort to collect and analyze all of those samples, and has a right to be the first to publish based on the results. Is it really in the interest of the “citizen scientists” to short-circuit that process and risk impairing the Geno2’s publication opportunities and thereby the flow of grants? Wouldn’t it be better to ask that he make all of the data public after publication to encourage wider review of his work as well as to enable the citizen scientists to use the data to further their genetic genealogical goals? It seems to me that Dr. Wells has made a remarkable effort to engage with the genealogical community this last year, likely because he sees it as a potential source of political and financial support. Let’s encourage that engagement by recognizing his needs and work with him directly rather than behind his back. I don’t see this as an issue at all, John, particularly since the Genographic Project is funded in large measure by the very high fees paid by us as testers. But I am confident that if Spencer Wells disagrees in any way, ISOGG would respond immediately — and appropriately — to his concerns. Dr. Wells is extremely supportive of our citizen scientists and encourages this type of research. I am quite sure that if NatGeo was worried about publishing this data, they would not have released it into the public domain yet. Argh. please correct K1c1b to 0.2%…. Do you mean that I-Z59 is 0.08% or 0.8%? I am also H1u, but can’t figure out where did it come from? Um… your parent, for sure, but I presume you mean back in time> Is this a YDNA or mtDNA haplogroup? Hey we had R-PF3434! if you’d like please let us know where you came from to see if there’s any relation. Feel free to Email us at [email protected]. my YDNA is already posted. Since Geno 2.0 testing is on-going, isn’t the haplogroup percentage a moving target? Not only will the percentage change if the proportions of future testers are different than the existing results, but the current percentages are only reliable if past testers were representative of the world’s population. Or is the percentage calculation adjusted in some fashion to account for smaller sample sizes from some groups? It certainly may change, but having data even for tests to date is useful. I had my uncle test for Geno and the result was R-PF3434 i haven’t been able to get information on this haplogroup if you can provide any i’d appreciate it immensely. Also, on FTDNA so far the result is R-L151 which is not R-L21 (Geno) so we are a little confused by this. FTDNA says it is the same results? is R-L151 under R-L21 or vice versa? My family comes from Spain presumably Barcelona and the Geno shows they were in the UK area at some point, no evidence of Spain as of yet. I understand this means that further testing must be made or they weren’t from Spain? Would appreciate the help! 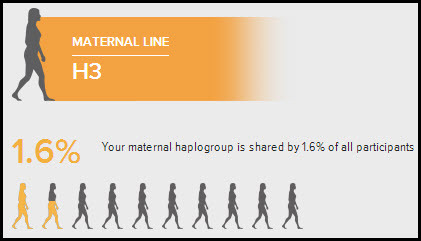 Your paternal haplogroup is shared by <0.1% of all participants in the project"
Maternal H42 here. Don’t see it in the spreadsheet. Paternal I-Z59 is on Y spreadsheet. Will: I’m also mtDNA H42. Are you interested in sharing ancestor info? I am H42 too. Are you interested in sharing any ancestor info? I’m P310 and U5A1B on Genographic and DF27 and U5 on FTDNA. :/ The two sites could work together and unify the results.